Find artworks, auction results, sale prices and pictures of Lawrence Alma-Tadema at auctions worldwide. Sir Lawrence Alma-Tadema, OM, RA (British, 1836-1912) The Education of the Children of Clotilde and Clovis signed and indistinctly dated 'L. Alma Tadema 18..' (upper left) oil on panel 65 x 91cm (25 9/16 x 35 13/16in). Footnotes Provenance Commissioned by Ernest Gambart, London, 1868. José de Murietta Collection; Sale, Christie's, London, 23 May 1873. Thomas Agnew & Sons, London (acquired from the above sale). E Brander Matthews Collection, New York (acquired from the above). James H. Stebbins Collection; Sale, American Art Associations, New York, 12 February 1889, lot 74. Anon. sale, American Art Associations, New York, 5 April 1918, lot 165. Holland Galleries, New York (acquired from the above). Private collection, Florida, by 1973. M. Knoedler & Co, New York. Anon. sale, Christie's, New York, 3 February 1978, lot 167. Mac Millan & Perrin Galleries, Vancouver. Anon. sale, Sotheby's, New York, 29 May 1980, lot 39. Anon. 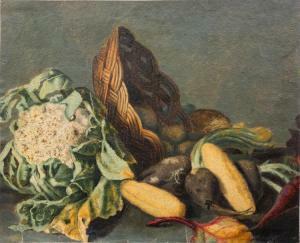 sale, Sotheby's, New York, 31 October 1987, lot 67. Private collection, Canada (acquired from the above sale). Exhibited London, French Gallery, 16th Annual Exhibition, April 1869, no. 54. New York, The Emily Lowe Gallery, Hofstra University, Art Pompier, Anti-Impressionism, 1974, no. 163. Literature Athenaeum, 10 April 1869, p. 510. Illustrated London News, 10 April 1869, pp. 360-361. J. Dafforne, 'The Works of Lawrence Alma-Tadema', Art Journal, XXVI, 1875, p. 136. E. Shinn, Art Treasures of America, vol. I, 1879, p. 95. C. Vosmaer, L. Alma-Tadema and C.J. 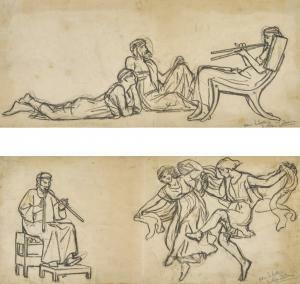 G Vosmaer, Alma-Tadema Catologue Raisonné, unpublished manuscript, Leiden, c. 1885, no. 76, 85. J. Belcher, 'The Royal Gold Medal, 1906 presentation to Sir Lawrence Alma-Tadema', Journal of RIBA, London, 3rd series, vol. III, 30 June 1906, p. 444. R. Dircks, 'The Later Works of Sir Lawrence Alma-Tadema O.M., R.A., R.W. ', Art Journal, supplementary monograph, London, December 1910, p. 27. V.G. Swanson, 'Alma-Tadema: his forgers and his imitators', 19th Century II, New York, Winter 1977, no. 4, pp. 66-70, pl. 4. V.G. Swanson, The Biography and Catalogue Raisonné of the Paintings of Sir Lawrence Alma-Tadema, London, 1990, pp. 150-151, no. 107. Lawrence Alma-Tadema finished studying at the Antwerp Academy in 1858, subsequently joining Louis De Taeye's studio. This was instrumental in Alma-Tadema's training, helping to hone his historical research skills and cement a focus on archaeological accuracy. He then joined the studio of Baron Henri Leys, considered one of the most important painters in Belgium. 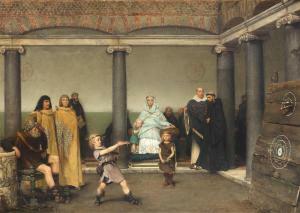 Whilst in Leys's studio, Alma-Tadema painted his acclaimed oil of 1861, Education of the Children of Clovis (School of vengeance, Training of Clotilde's sons). The work, larger than any known painting from this early period of Alma-Tadema's career, was widely exhibited ; the dealer George Ebers declared in 1886 that the work, 'first laid the foundation of [the artist's fame]'.1 Another critic claimed that it showed four elements of the artist's style: historical authenticity, genuineness of accessories, clarity of colour and skill in grouping figures.2 During the period between 1861–1865, Alma-Tadema painted four other works showing the history of the Merovingians. The Merovingians were a dynasty of Frankish kings, who ruled in ancient Gaul, from the 5th to the 8th centuries. The founder of the dynasty, Clovis I, reigned from 481-511 AD, and overthrew the last Roman governor to unify the Frankish kingdom, expanding the Frankish kingdom to include the Netherlands and much of the territory of what is now present day France. Merovingian history was not a very popular choice at the time for artists, although perhaps intriguing to Alma-Tadema due to his Dutch heritage. Painted in 1868, the present lot, similarly to the 1861 work, presents an interpretation of 6th century events. The parents of Clovis' wife, Clotilde, were murdered by Gondobald, King of the Burgundians. Clotilde is shown training her sons to avenge the murders. The drama of the work is heightened by the young age of her sons: Chlomoder attempts to hit the target with an axe while Childebert awaits his turn, gripping an axe in his hands and the youngest, Chlothar, remains at the Queen's side. The stoic Queen is depicted, seated in a throne, her voluminous attire and pose radiating strength; she assesses the training ground with a steely, unflinching gaze. The architecture in the present version is different from the 1861 oil. According to the Journal of the RIBA, the changes came in the wake of Alma-Tadema's trip to Italy in 1863, where he 'studied the Early Christian churches'. He has also implemented a more enclosed composition (without the glimpse of open, blue sky and the greenery in the courtyard) and with less figures present, it focuses the viewers' attention on the Queen and her protégés. The present lot was commissioned by Ernest Gambart, the hugely influential Belgian born dealer and print publisher. Gambart was instrumental in promoting a number of artists; among the most popular reproductions that he published were William Holman Hunt's The Light of the World (1858) and William Powell Frith's The Derby Day (1858). Gambart met Alma-Tadema in 1864 and encouraged him to come to England under his patronage. Alma-Tadema depicted Gambart in his Royal Academy exhibit from 1874, entitled The Picture Gallery (Towneley Hall Art Gallery and Museums, Burnley). 1 G Ebers, The Ebers Gallery, Stuttgard and Lepzig, 1886, p. 23. 2 V.G. Swanson, The Biography and Catalogue Raisonné of the Paintings of Sir Lawrence Alma-Tadema, London, 1990, p. 129. BRITISH LOVE'S JEWELLED FETTER (THE BETROTHAL RING) Sir Lawrence Alma-Tadema, O.M., R.A. 1836 - 1912 signed L Alma Tadema and inscribed Op. CCCXXVIII- (upper left) oil on panel 25 by 17 1/2 in. 63.5 by 44.5 cm Provenance George Mc Culloch, Esq. (commissioned directly from the artist, 1895) Mrs. Coutts Michie (by descent from the above, her father, and sold,Christie's, London, May 28, 1913, lot 112) Wallis & Sons, London H.A. Oliver, Esq. (acquired from the above, May 1914) Sale: Sotheby's, London, June 19, 1990, lot 56, illustrated Private Collection, New York Thence by descent Exhibited London, New Gallery, 1895, no. 73 London, Art Gallery of the Corporation of London, Guildhall, Loan Collection of Pictures by Painters of the British school who have flourished during Her Majesty\’s Reign, April 7-July 14, 1897, no. 117 (lent by George Mc Culloch, Esq.) Glasgow,International Exhibition, 1901, no. 523 (lent by George Mc Culloch, Esq.) London,Royal Academy, Exhibition of Modern Works in Painting and Sculpture forming the Collection of the Late George Mc Culloch, Esq., Winter Exhibition, Fortieth Year,January 4-March 13, 1909, no. 76 London, Royal Academy,Exhibition of Works by the Late Sir Lawrence Alma-Tadema, R.A., O.M. : Winter Exhibition, Forty-Fourth Year,January 6-March 15, 1913, no. 166 (lent by Mrs. Coutts Michie) Literature Athenaeum, London,March 16, 1895, p. 351 Magazine of Art,London,1895, p. 285-7 Henry Blackburn,New Gallery, 1895, pp. 10, 41, illustratedp. 41 Percy Cross Standing,Sir Lawrence Alma-Tadema,O.M., R.A., London, 1905, p. 99 D. Croal Thomson, "The Late Mr. George Mc Culloch,"Art Journal, 1908, p. 44 Rudolf Dircks, "The later works of Sir Lawrence Alma-Tadema,O.M., R.A., R.W.S," Art Journal, Christmas Edition, London, 1910, p. 16, illustrated p.32 Vern G. Swanson,Alma-Tadema: The painter of the Victorian Vision of the Ancient world,London, 1977, p. 140 Vern G. Swanson,The Biography and Catalogue Raisonnéof the Paintings of Sir Lawrence Alma-Tadema, London, 1990, p. 251, no. 366, illustrated p. 454 Rosemary J. Barrow, Lawrence Alma-Tadema, London, 2001, p. 158, illustrated pl. 158 Catalogue Note Love\’s Jewelled Fetter is distinguished by the gem-hued palette of a riotous azalea bush dominating the foreground and a brilliant azure sea extending towards the horizon. 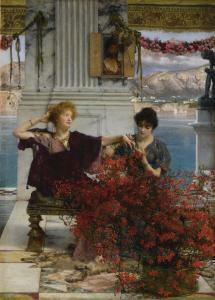 Two beautiful patrician women, arranged on a bronze settee upon a marble terrace under floral garlands, overlook a mountainous coast studded with Roman villas. Sir Lawrence Alma-Tadema surely sought to convey a calm Bay of Naples, the area described in ancient sources as a popular resort during the early Empire, where the elite escaped from Rome to theirvilla maritime(luxury villas) nestled among the region\’s cliffs. However, the present work and similar compositions of the period, likeCoign of Vantage(1895, J. Paul Getty Museum, Los Angeles) and Fortunes Favorites (sold in these rooms, November 22, 2016, lot 47),were not directly informed by the artist\’s travel to Italy, butby the large Bavarian lake, Steinberger See, where his friend Georg Ebers, the German Egyptologist, had a villa (Edwin Becker, Edward Morris, Elizabeth Prettjohn, and Julian Treuherz, eds.,Sir Lawrence Alma-Tadema, exh. cat., Van Gogh Museum, Amsterdam; Walker Art Gallery, Liverpool, 1997, p. 255-6; Swanson, p. 252, 253). The present work\’s subject is inspired by the novella, The Amazon (1880, English translation 1884) by Alma-Tadema\’s friend, the historian Carel Vosmaer, in which the main character is a Dutch artist named Siwart Aisma, based on Alma-Tadema himself. When Vosmaer accompanied Alma-Tadema on one of his many trips to Italy he remarked on the painter\’s \“astonishing accuracy, tirelessness and fire: he espied the door grooves, the bolt holes, everything, everything\” (as quoted in Robert Verhoogt, Art in Reproduction, Amsterdam, 2007, p. 497). Not surprisingly, the plot follows the Dutch antiquary\’s obsessive study of Roman sculpture collections, as well as his romance with the poet, Marciana van Buren (Barrow, p. 91). Alma-Tadema\’s scene illustrates a moment where Marciana, shown in violet robes, extends her hand to a companion to examine her ring (the fetter), a token of her and Aisma\’s love. The statue at the upper right of the composition, Spinario, alludes to Aisma\’s interests in classical sculpture while aligning with Alma-Tadema\’s own (he owned a photograph of the sculpture and it appears in multiple compositions). The scene seems to occur under the watchful eye of Aisma, who looms from the portrait hanging above them, inscribed Amo Te Ama Me (I love you, so love me too). The scale and format of the portrait suggests that it is based on a \“Mummy portrait,\” the naturalistic likeness affixed to Egyptian mummies during the Coptic period, dating from the Roman occupation of Egypt. Ebers was particularly interested in \“mummy portraits,\” and Alma-Tadema\’s inclusion here casts a link across time and space, and further evidence of the artist\’s voracious curiosity for the Ancient world. A tour-de-force of nineteenth century painting and among Alma-Tadema\’s most striking compositions, Love\’s Jewelled Fetter was painted during an extraordinary period forthe artist and the same year that he presented Spring (1894, J. Paul Getty Museum, Los Angeles) at the Royal Academy.Unsurprisingly, it drew the attention of the progressive contemporary art collector, George Mc Culloch. Croal Thomson\’s tribute to him, published in The Art Journal, read \“The death of Mr. George Mc Culloch… removed the greatest patron of the artist to-day. From the first time he purchased a picture, this keen lover of the arts of painting and sculpture was imbued with the feeling that, for him, the works of the artists of his own time were most suited to his taste, and no persuasion ever carried him past that conviction.\” He goes on to exhaustively list the artists included in the extraordinary collection, specifying that \“Sir Lawrence Alma-Tadema\’s careful painting is adequately represented by The Sculptor\’s Gallery [1874, Hood Museum of Art, Hanover, New Hampshire] and Love\’s Jewelled Fetter, the latter a brilliant piece of coloring\” (The Art Journal, p. 43-4). Many works in Mc Culloch\’s collection have become some of the most beloved in publicinstitutions around the world, and when his sale took place in 1913, newspapers trumpeted record breaking prices for such celebrated British masterpieces as John William Waterhouse\’s Saint Cecilia (1895, Private Collection), Frederic Lord Leighton\’s Daphnephoria (1874-76, Lady Lever Art Gallery),Edward Burne Jones\’ Love Among the Ruins (1894, Wightwick Manor, West Midlands), George Clausen\’s Ploughing (Aberdeen Art Gallery) as well as continental works such as Jules Bastien-Lepage\’s Pas Mèche (1882, National Gallery of Scotland) and Pauvre Fauvrette (1881, Glasgow Museums). 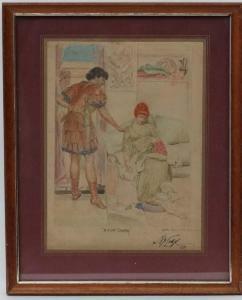 .. Lodge after Sir Lawrence Alma- Tadema, Watercolour, 'A Silent Greeting ' , Ascribed , titled and signed lower right with date '1/07'. 7 3/4 x 5 3/4" CONDITION: Please Note - we do not make reference to the condition of lots within descriptions. All lots are 'sold as seen' . Please contact us for more information. PROPERTY OF A GENTLEMAN Sir Lawrence Alma-Tadema, O.M., R.A. STUDY FOR MERRY MUSIC; STUDY FOR SERIOUS MUSIC 1836-1912 Quantity: 2 both inscribed and signed l.r. : Pour Leblotte/ L. Alma-Tadema both black chalk each 14 by 34cm., 6 by 14in. Provenance Christopher Wood, London; Christie's, London, 5 June 2006, lot 97, where purchased by the present owner Exhibited Campbell Wilson and Christopher Wood, English Romantic Art 1850-1920, 2005, no.34 Literature Vern G. Swanson, Biography and Catalogue Raisonnee of Sir L. Alma-Tadema, 1980, no.178 Catalogue Note These are sketches for the three panels painted in 1873 by Tadema for the underside of the lid of a John Broadwood & Sons pianoforte which was in Tadema's possession until 1912.